As the general rule states a shoe can only go for 800-1000km (500-620mi) I’m constantly looking for nice promotions of my regular shoes. On Facebook however I saw suddenly that Pearl Izumi provided some free shoes if you were willing to evaluate them after a couple of months. I did not “win” the free shoes, but due to popular demand all those who had applied could get a 50% discount on the shoes. This was more than a fair discount and seeing that the fitting proved promising I bought them. First off, note that is a neutral shoe, which may differ with your own feet. Over- or underpronation require different shoes! Ever since the first fitting at the store the shoe slid on my feet like a glove. So in very general terms, it’s a very comfortable shoe. It felt like coming home and putting on my slippers. This automatically made me sceptical for long runs, but more on that below. The shoe, as you can see in the specs has ‘dynamic offset’, which means the drop differs from stance to stance and energy input. At a 4-7.5mm drop, this is lower than the average running shoe, which makes it nice shoe if you’re trying to go towards minimalism running. Automatically this means less cushioning than the average shoe. I have a decent mid-heel landing, which doesn’t make this an all to big problem for me, but if you’re a full-blown heel lander I wouldn’t immediately recommend it, unless you’re coming from another shoe with less cushioning and are happy with it. The site says it’s a 1:1 Shock Absorption, but my Brooks for example absorb more than these. The sole’s stiffness seems below average. It’s rather bendable, Pearl Izumi says it’s a 1:1 Energy input-output which I’m inclined to believe. They are not waterproof at all, but this means it is a very breathable shoe. Especially during hot summer days this is my go-to shoe. The air flows through them in a way that seems to limit sweating. 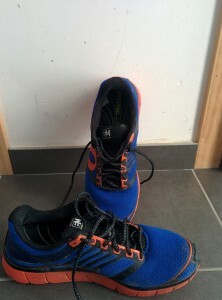 The breathability along with the general comfortable feel makes it a nice shoe for the long runs. Bear in mind, yet again, that the drop is somewhat below average, so I would not be surprised that some people’s achilles heel would hurt after +16km (+10mi). With their low weight and nice breathability, they make a more than decent racing shoe. In very wet conditions the sole can get somewhat slippery, so try to check your terrain beforehand. In terms of durability I’m somewhat dissapointed. 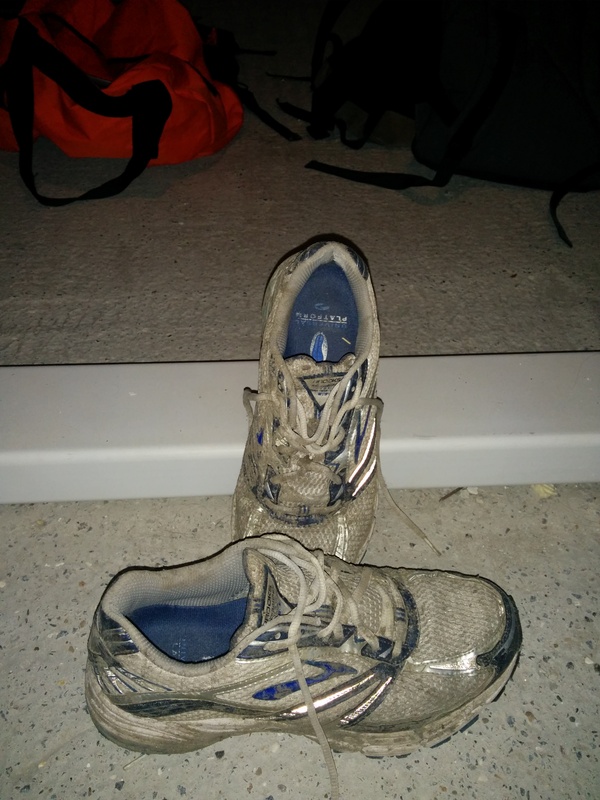 I’m at about 800km (500miles) with these shoes and I feel that it’s time for a new pair. Shorter runs no problem, but with the long run I start to feel it more in my knees than usual. 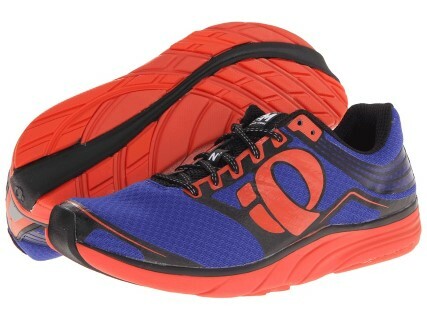 I recommend this shoe for every runner who wants a smaller drop and has at least 1-2years experience in running. They need some experience when you go and fit them to know if this is the shoe for you. They really fit like a glove from day one, so this will be a standard pair in my closet from now on! I’ve decided to review all of my gear starting with my oldest stuff. This way I hope to help people should they need pro’s and cons for running gear. This purchase dates from some years ago (Christmas gift :-)) and the shoes aren’t for sale anymore in the common stores. The shoes, as you can see in the specs, have a fairly big drop, which means your heel will be higher than your toes. 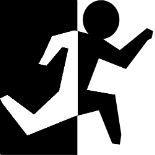 When you are into minimal running, stay away from it, as this is nothing for you. Plus side of this big drop is the cushioning in the heel, which is great for paving the asphalt. Biggest downside however is that this makes it harder to land on the middle of your foot or in the front. You will easily be pushed towards a heel landing. The cushioning catches this, so all-in-all it’s not that of a problem, but if you’re working on your running form and foot landing, I’d suggest a shoe with a smaller drop. unfortunately, I have sweaty feet. So breathability always is an issue for me. This is not something you can test by wearing the shoes in a store for a test run, so it’s always waiting for my first long run before I can judge. The Brooks Adrenaline GTS 12 does a good job about it. I never completed a run where I could wring out my socks. And when running into the wind I could sometimes even feel the flow going through my shoes.Sadly, this automatically means it is not waterproof. Not even one bit. Running in the rain? Wet feet. Aside from sweaty feet, I have wide (fore)feet as well. This often means choosing another shoe simply because I would rip the fabric in the front. GTS 12 is wide enough for me, so no issues there. For racing I would advice against them. They are too bloated. 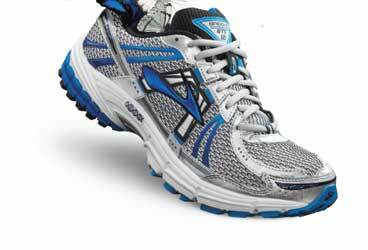 A shoe with less weight, smaller drop, less cushioning would improve your race. 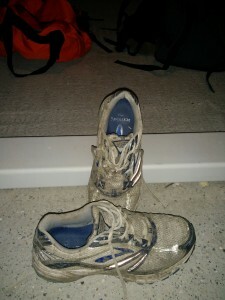 In term of months, I wore them for a long time, as running was only a ‘when-I-Have-the-time’ thing back then. But I think I wore them for about 1200km (750 miles). Which is a nice average for a running shoe I’d say. I would definitely advice this shoe for a starting runner as it is a nice basic shoe with a lot of support in the right places. Once you get more experienced you automatically will feel if a lighter shoe or more/less drop or … would serve you better. Brooks is an established brand that is widely available, so finding a similar shoe shouldn’t be all that difficult.